Only available to groups of 20 or more – all other tickets must be paid for at time of booking. Your tickets can either be sent to you (postage charge is 75p) or can be collected in person from the Box Office. Available to full time students (with identification), people aged 60 and over and disabled people and unemployed people (with appropriate identification). May not be available at hired events. Some events have a special school discount, which includes free tickets for teachers/lecturers/education assistants (on a ratio of 1 to 10 unless otherwise agreed with the venue). Please call the Box Office on 03000 040 444 for more information. We welcome payment by credit/debit card free of charge. Cheques and postal orders should be made payable to Rhondda Cynon Taf CBC. We accept theatre tokens – please call the Box Office for more information. Your tickets can be exchanged for another event, or a credit voucher can be issued (either option only up to the value of your original ticket purchase), up to 24 hours before the performance commences. Refunds are not available for any event, unless the event has had to be cancelled or postponed. When you book tickets at The Coliseum Theatre or The Park & Dare Theatre you provide us with some basic personal information in order for us to process your booking. 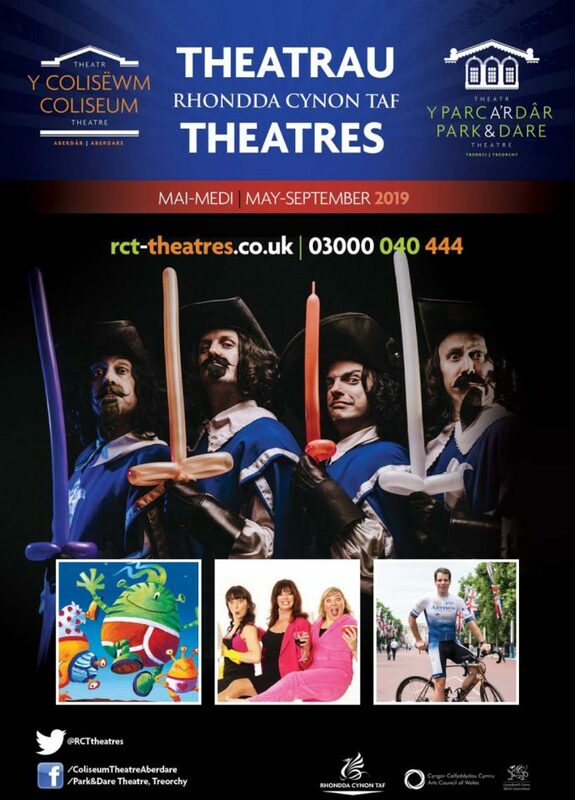 At the time of your booking we will also ask you if you wish to receive information about forthcoming productions and events at The Coliseum Theatre and The Park & Dare Theatre. If you provide your consent, then we will occasionally contact you with this information. We will not share your details with anyone beyond The Coliseum Theatre or The Park & Dare for marketing purposes, nor will we pass your information onto third parties except to facilitate our mailing to you. We will offer you the opportunity to opt out of future mailings at every contact, either by email or by contacting our Box Office on 03000 040 444.